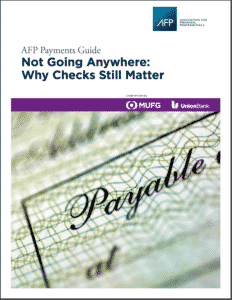 The Association for Finance Professionals (AFP) has made available a white paper entitled “Not Going Anywhere: Why Checks Still Matter” (log-in required) that offers valuable insights in an easily digestible package. As pointed out in the report, check use in the United States for business-to-business (B2B) transactions remains at roughly 50% in spite of a multitude of recent advances in payments technology. The White Paper also points out that, according to the 2016 AFP Electronic Payments Survey, B2B payments by check actually increased by 1 percentage point from 2013 to 2016. I’m sure many people both inside and outside of the check world probably went back to reread this. What about all the super-slick ePayment methods that we’re told the millennials are embracing en masse and the Boomers are beginning to begrudgingly accept? Greg Litster, president of high-security check provider SAFEChecks, points out that some corporations keep checks because fraud schemes focused on other payments are skyrocketing. He’s even seen organizations move into e-payments, only to return to checks. According to the 2017 AFP Payments Fraud and Control Survey, 74 percent of finance professionals report that their organizations were targets of payments fraud in 2016, and of those 75 percent were victims of check fraud. Still, the report is careful to point out that “check fraud hits companies that are small and unsophisticated, and ones that are large and—theoretically— sophisticated.” But many of these occurrences are single occurrences.